Wolverhampton suffered a 2-0 defeat to Burnley in the weekend as their woeful record against bottom-half teams continue. Wolves boss Nuno Espirito di Santo decided to shuffle his first team which backfired and led to their 8th loss of the season. Meanwhile, Man United won 2-1 against Watford in the weekend and another win today could see the Red Devils move to 3rd in the league table. Wolves are expected to line up in a 3-5-2 formation while Man United could line up in a 4-3-3/4-3-1-2 formation depending on the fitness of specific players. Ryan Bennett is back in contention after serving his two-match ban for accumulating too many yellow cards. Raul Jimenez and Matt Doherty who were rested for the weekend match against Burnley are expected to start against the Red Devils. Anthony Martial and Romelu Lukaku are back in contention after recovering from injuries while Victor Lindelof will be assessed before the match. Alexis Sanchez, Antonio Valencia, Eric Bailly and Matteo Darmian will miss the clash with respective injuries. 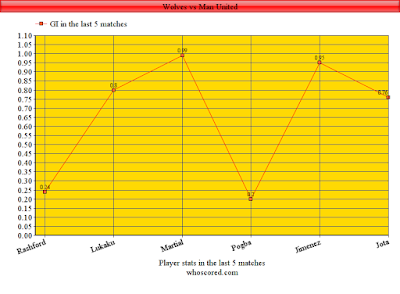 Wolverhampton and Man United have competed only nine times in the Premier League with the Red Devils dominating with six wins. 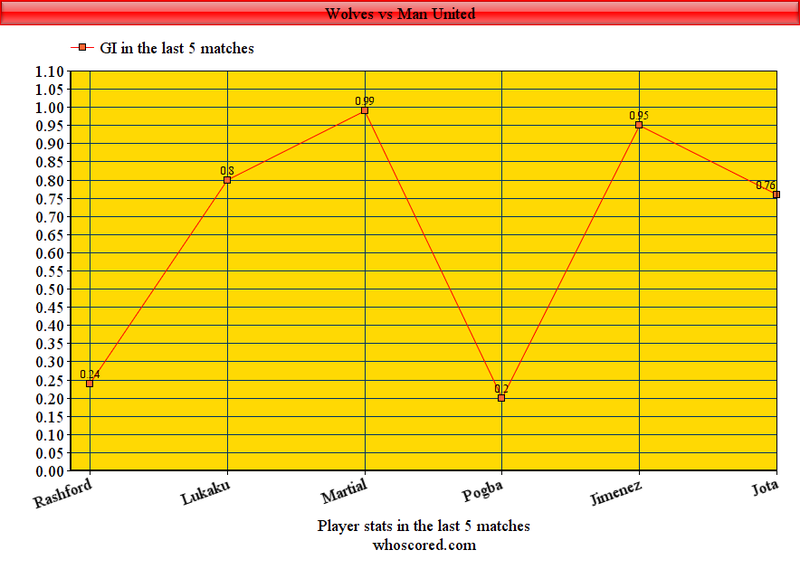 Wolves have won only two times and a draw between both sides. The last encounter between the two sides resulted in a 1-1 draw in September 2018 with Joao Moutinho scoring the equalizer after Fred opened the scoring for the Red Devils. • Wolves have won more points against ‘top six’ in the Premier League this season than any of the other 14 teams in the competition (10- W2 D4 L3). • Following their 2-1 win against them in the FA Cup quarter-final, Wolves are looking to beat Manchester United twice in the same season for the first time since 1979-80, when they won both top-flight games against the Red Devils. 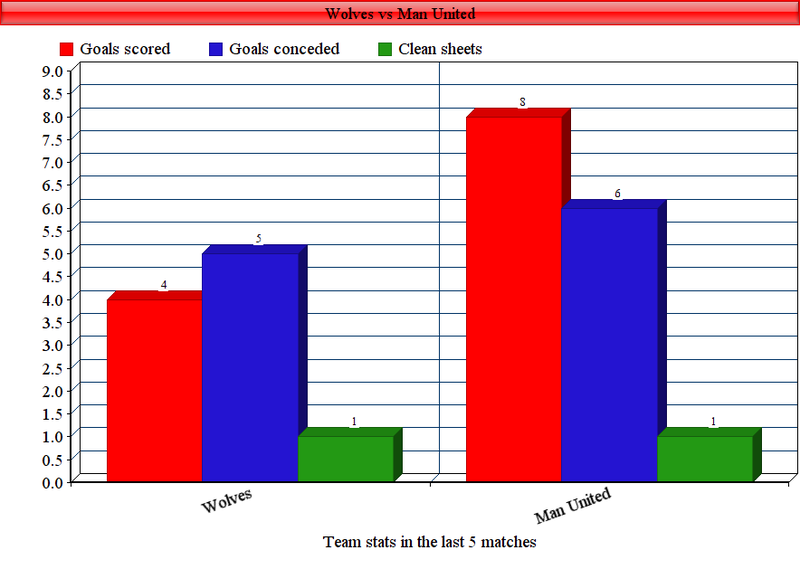 • Wolves are unbeaten in four home Premier League games (W3 D1), keeping a clean sheet in two of the last three. • The last time Man United failed to win home or away against a promoted side in a single Premier League campaign was back in 2002-03, drawing at home and losing away at Man City. • Paul Pogba has been directly involved in five of Man Utd’s last eight away goals in the Premier League (2 goals, 3 assists). Talk about being invisible, Paul Pogba’s drastic dip in form has been a worry for the Red Devils, the Frenchman has provided only one assist in his last five games. Anthony Martial has been involved in the majority of the goals for the Red Devils scoring a goal every 136 minutes. For Wolves, the goals have been coming from either Raul Jimenez and Diogo Jota as they have been playing on the counter mostly. Wolverhampton’s frequent rotations have led to a loss of form as the Wolves dropped points to both Huddersfield and Burnley. The Wolves have conceded more goals than scored despite facing three of the bottom-six teams. Man United have double the goals as compared to Wolves and both teams have the same number of clean sheets in the same period of time. Wolverhampton have the psychological advantage over Man United after their brilliant FA Cup victory against the Red Devils. While Man United will be looking for a much-needed win in order to keep their top four hopes alive. With the Wolves defending deep and looking to attack on the counter, the Red Devils cannot offer a lot of players forward. Overall, we expect this to be a open game with lots of chances on both ends.